J Drugs Dermatol. 2018 Jan 1;17(1):106-112. Safety and Efficacy of a Non-Invasive 1060 nm Diode Laser for Fat Reduction of the Abdomen. Changes in temperature are known to produce apoptosis in adipocytes. This study examines the use of a non-invasive treatment that applies 1060 nm laser energy transcutaneously to hyperthermically induce disruption of fat cells in the abdomen. Thirty-five subjects received application of 1060 nm laser on the abdomen for fat reduction. Ultrasound images and high-resolution two-dimensional photography were recorded at baseline, 6 weeks, and 12 weeks post treatment. Subjects maintained a stable diet and exercise routine throughout the course of the study. Weight was recorded at baseline and each follow-up visit. Three board certified dermatologists were trained as blinded evaluators and tasked with identifying before and after photographs from randomized, paired baseline, and 12-week photographs. Ultrasound images were used to measure the fat thickness change from baseline at 6 and 12 weeks. Level of patient satisfaction was graded at 12 weeks using a 6 point Likert scale. 23% of subjects were Fitzpatrick IV-VI. Blinded evaluators correctly identified the post-treatment photograph 95% of the time (88%, 97%, and 100%). Mean reduction in fat layer thickness from baseline was statistically significant (P less than 0.001) at both 6 weeks (1.5 +/-1.23 mm) and 12 weeks (2.65 +/-1.41 mm). Mean weight change was +0.1 lb. Side effects were mild to moderate including edema, tenderness, and induration mostly resolving within 1-3 weeks post treatment. No serious adverse events were reported. 106-112.J Drugs Dermatol. 2017 Jan 1;16(1):48-52. 1060 nm Diode Hyperthermic Laser Lipolysis:The Latest in Non-Invasive Body Contouring. 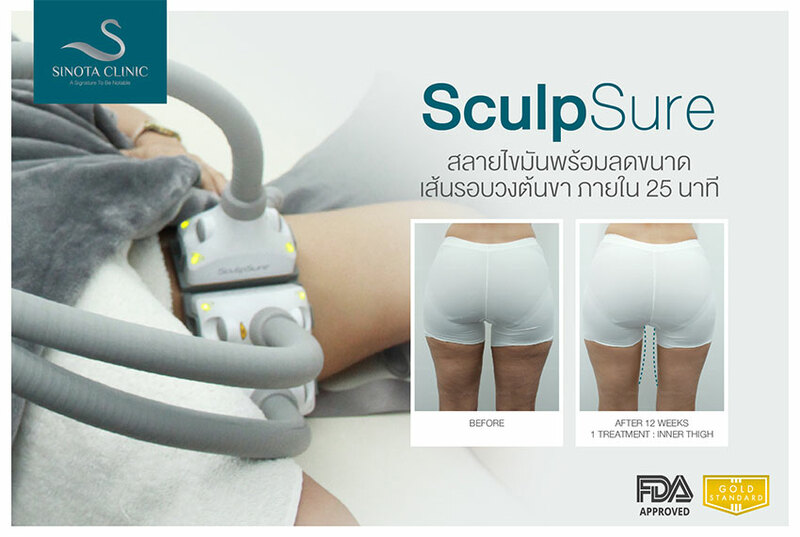 Schilling L, Saedi N, Weiss R.
Non-invasive body contouring is becoming increasingly popular in the United States. Using the 1060 nm diode laser to achieve hyperthermic temperatures within the adipose tissue with subsequent lipolysis is one of the most recent advancements in this field and is the first of its kind. This wavelength was carefully chosen to effectively target the unwanted adipocytes while sparing the overlying skin and adnexae. Appreciable results are achieved after a single treatment, and these results are comparable to other non-invasive technologies. The 25-minute procedure is well tolerated among patients, with no downtime required. This versatile system allows for treatment of multiple body sites, which can be customized for a particular patient’s needs. Herein, we discuss in detail the mechanism of action, efficacy, and safety of 1060 nm diode hyperthermic laser lipolysis. Amongst the various body contouring modalities available today, the 1060 nm diode hyperthermic laser is a worthy addition providing a safe, quick, and effective non-invasive fat reduction option for patients. <em>J Drugs Dermatol. 2017;16(1):48-52. Bingol UA, Cinar C. Laser lipolysis without suction: reality or myth? Photomed Laser Surg. 2014 Nov;32(11):642-5. Bass LS, Doherty ST. Safety and Efficacy of a Non-Invasive 1060 nm Diode Laser for Fat Reduction of the Abdomen. J Drugs Dermatol. 2018 Jan 1;17(1):106-112. Schilling L, Saedi N, Weiss R. 1060 nm Diode Hyperthermic Laser Lipolysis:The Latest in Non-Invasive Body Contouring. 106-112.J Drugs Dermatol. 2017 Jan 1;16(1):48-52.